The Hazards of Looking Back: re-reading E.F. Benson’s “Colin”, by Jane McChrystal. I usually find middle-brow fiction quite consoling. So, I turned to my bookshelves in search of something not too literary in the hope of distraction from these troubled times. Colin, a supernatural tale, published in two parts by E.F. Benson in 1923, seemed to fit the bill. When I came across Colin on its republication in 1994, I was already a fan of Benson’s Mapp and Lucia novels and the ghost stories of his contemporary, M.R. James. I remembered how much I’d enjoyed Colin when I read it on holiday in Greece, and hoped to repeat the experience on a gloomy February day in London. E.F. Benson was born in 1867, the fifth child of E.W. Benson, who was to become the Archbishop of Canterbury in 1883. Benson studied at Cambridge University and later became an honorary fellow of Magdalene College, while he pursued his career in writing. Around the same time M.R. James established a reputation as an outstanding medieval scholar and became Provost of Kings College, Cambridge, before going on to take up the post of Headmaster at Eton. Cambridge and Oxford Universities decreed a state of celibacy for all academics until the 1860’s and, long after this prohibition was lifted, it provided a haven for closeted, gay men, like Benson and James, where they could remain unmarried and mix in an exclusively male environment without stimulating unwelcome curiosity about their sexual orientation. Subsequent generations of readers scouring their work for hidden themes of homosexuality can find easy pickings in the high camp of the Lucia stories, where Georgie and Lucia enter a mariage blanc based on their shared love of playing Mozart duets and speaking cod Italian. Writing about the supernatural provides fertile ground for all sorts of inexpressible inclinations. So it’s hardly surprising, then, that Benson and James were both drawn to this literary tradition. “….Love, can find no seed cranny in their hearts”, while any woman they marry, “freezes in the Arctic cold of lovelessness”. Generations of Stanier sons have kept the covenant through practising satanic rites down the ages and it can only be dissolved if one of them decides to renounce it. When we meet Colin, the younger brother of his twin, Raymond, he is consumed by the desire get rid of Raymond, marry his cousin, Violet, and become heir to the Tudor House, built by the original Colin. By the end of Colin I he has fulfilled all his ambitions. This deceptively simple summary conceals a tortuous plot, revolving around Colin’s repeated efforts to show that the brothers were born within or without marriage, by tricking his way into the British Consul’s office in Naples and altering the relevant records. Various subplots determine whether it would be to his advantage or disadvantage to be a legitimate or illegitimate son. These efforts turn out to be redundant, when Raymond drowns accidentally in a lake before Colin’s eyes, with no apparent complicity on his part or that of the devil. The beginning of Colin II finds him in charge of Stanier House, with Violet, now the mother of their fourteen month old son, as its chatelaine. The second volume focuses on a struggle between Evil, embedded in his pact with the devil, and Love, in the form of his relationship with his son, Dennis. The satanic shenanigans in Colin II proved quite a slog for this reader. In the early Twentieth Century some quite eminent people, such as the poet, W.B. Yeats, took magic very seriously. Indeed, Yeats believed that his faith in the benign powers of the Hermetic Order of the Golden Dawn were the well spring of his creativity. The darker side of this craze for magic was represented by a lesser poet, Aleister Crowley, who was expelled physically from the Hermetic Order’s headquarters when he tried to take possession of its paraphernalia on behalf of a rival sect, in an episode which became known as the Battle of Blythe Street. In this context it’s easy to imagine why Colin’s contemporary readers probably gained a genuine frisson from its satanic elements wherein he recruits two creepy acolytes to help him conduct black masses in the family chapel, which he has converted into a venue for devil worship to guarantee his continued success. Those of us who grew up in the 1960’s and 1970’s with memories of genre fiction produced by writers like Dennis Wheatley, such as The Devil Rides Out, and their Hammer Films adaptations, will find it difficult to react to Colin’s malefactions with the kind of horror they were intended to provoke. The action in the novel switches between Stanier House in Kent, London, Naples and Capri, and perhaps the images of life on a Mediterranean Island – its landscapes, mythologies, scents and light – are the most beguiling aspects of the novel, as many modern readers will have their own memories of the pleasures they depict. They were the same pleasures experienced by Benson and other writers, such as W. Somerset Maugham, who took regular holidays together on Capri. The portrayal of Italians doesn’t come off so well. Some, like the beautiful young Capresi, become avatars of amoral, pagan sensuality, while others embody the type of florid vulgarity, emotional incontinence and greed which mars the depiction of Tuscans in E.M. Forster’s Where Angels fear to tread. It’s a shame that these buttoned-up Edwardian gentleman shared so many of their compatriots’ prejudices towards their hosts, when they were looking for a kind of freedom in Italy they couldn’t find in their home country. “Nino, but for a towel round his loins, was still as Nature had made him. But she had done it very nicely, and as he handed his master his clothes, Colin looked at his shapely shoulders and broad chest. Which is, on reflection, is a coy, awkward piece of writing and maybe says something about Benson’s own awkward relationship with his attraction to men. Unfortunately, there is also some rather queasy stuff which describes Colin’s gaze lingering on his son as he reaches puberty, not easy to stomach from our modern standpoint. Benson was a gay man living with a sexual identity he could only express in a limited way through his association with Cambridge academics and his holiday companions in Italy. It seems likely that the lengthy treatment of his protagonist’s obsession with Satanism demonstrates a terrible fascination with something in himself he can’t accept, get rid of or show to a wider world. I don’t think I’m giving too much away when I say that Colin eventually sacrifices himself and frees the Staniers from the family curse to save Dennis from the devil. Benson was following a well-trodden path where the reader is invited to indulge in the secret enjoyment of all the naughty stuff, which makes up most of the story, safe in the expectation that goodness will triumph and deliver a suitably moral conclusion to the tale. 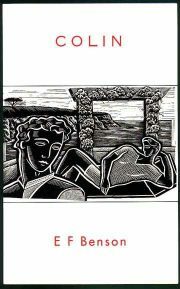 On my first reading of Colin, I was caught up in its sensational themes and the romantic evocation of life on Capri written in a purplish prose. It seems my capacity for immersion in another’s imagination without asking too many questions has been shrinking over the years. This time I was struck by the way in which the pressure Benson experienced to suppress an essential part of his nature, plays out through the characters he created and what he put them through, which makes for a less comfortable, but more challenging, read. Colin I and II, Millivres Books, 1994.